For the 2015 comedy film, see Don't Worry Baby (film). (1964) "When I Grow Up (To Be a Man)"
"The Warmth of the Sun"
"Don’t Worry Baby" is a song written by Brian Wilson and Roger Christian, produced by Wilson and first recorded by the American rock band, the Beach Boys. The band's version, a tender ballad with falsetto lead vocal by Wilson, was first released on their 1964 album Shut Down Volume 2. 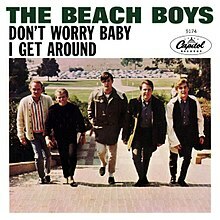 It was also released as the B-side of The Beach Boys' first US number-one, "I Get Around", also reaching number 24 on the Billboard Hot 100 in its own right. The song "Don't Worry Baby" is part of The Rock and Roll Hall of Fame's 500 Songs that Shaped Rock and Roll list. It is ranked as the 178th greatest song of all time in Rolling Stone's 500 Greatest Songs of All Time, and Pitchfork Media placed it at number 14 on its list of "The 200 Greatest Songs of the 1960s". The song, as originally performed by the Beach Boys, is sung from the point of view of a teenager who reluctantly agrees to a challenge to race a rival after rashly bragging about his car, and is reassured by his girlfriend's plea to take her love with him when he races. David Howard wrote that "Don't Worry Baby" was a "subtle harbinger for the growing dichotomy within the California Sound. While 'I Get Around' symbolized the sunshine ideal in all its carefree splendor, 'Don't Worry Baby' suggested something entirely more pensive and even slightly dark underneath its pristine facade." Recording took place on January 7, 1964 at United Western Recorders' Studio 3, Hollywood. Vocals and guitars were overdubbed one or two days later. Take 12 was used for the master. Brian Wilson cited the song as his attempt to capture the essence of his all-time favorite record, "Be My Baby" by the Ronettes. Wilson estimates he has listened to the latter song "more than 1,000 times." Track details courtesy of session archivist Craig Slowinski. The stereo mix of the song had been used on Shut Down Volume 2 when it was released in 1990 and 2001. A single mono mix appeared on the 20 More Good Vibrations compilation. On the 2008 Singles box set, a mono album version was used instead of the single mix. The original stereo mix of "Don't Worry Baby" had Brian's lead vocal hard-panned in the left channel, the instrumental track in the centre and backing vocals on the right, and had an uneven fade out with most of the instruments abruptly fading out before the vocals. Thanks to the discovery of the lost multi-track masters in 2009, an alternate stereo mix was created from the analog master with the instrumental track and Brian's lead vocal placed in the middle channel while the backing vocals were shared between the left and right channels with a more finished fade out at the end. This new stereo mix can be found on the 2009 compilation Summer Love Songs and the 2013 boxset Made in California. Lorrie Morgan sang lead vocals on the Beach Boys' 1996 Stars and Stripes Vol. 1 album and was their only venture into the genre of country music to date. This version peaked at number 73 on the Billboard Hot Country Singles & Tracks chart. The production of "Don't Worry Baby" formed the basis of the Byrds' recording of "Mr. Tambourine Man". Garbage's 1998 single, "Push It", contains an interpolation of its chorus, and Wilson/Christian were given songwriting credits. (1977) "Still the Lovin' Is Fun"
A cover version of "Don't Worry Baby" was done by B.J. Thomas in 1977. His producer Chris Christian, who had recently produced BJ's gold Contemporary Christian album "Home Where I Belong" had met the MCA Records executives while working the Olivia Newton-Johns album "Don't Stop Believing" in Nashville. Chris presented the idea to the MCA executives to sign BJ to MCA, and record a cover of "Don't Worry Baby". MCA agreed and the following cover went on to become a moderate success, peaking at numbers #17 on the U.S. Billboard Hot 100 (outcharting the Beach Boys' original) and #2 on the Billboard Adult Contemporary chart as well as reaching number 12 on the pop charts in Canada. This would go on to become Thomas's last major hit in the pop sphere for either nation to date. ^ a b Howard 2004, p. 57. ^ "500 Songs That Shaped Rock". Rock and Roll Hall of Fame. Retrieved November 15, 2014. ^ "200 Greatest Songs of the 1960s". Pitchfork. Retrieved 2010-07-24. ^ Doe, Andrew Grayham. "GIGS64". Endless Summer Quarterly. Retrieved November 8, 2014. ^ Spitz, Marc (2013-08-16). "Still Tingling Spines, 50 Years Later". The New York Times. The New York Times Company. p. AR8. Retrieved 2016-02-24. Brian Wilson of the Beach Boys estimates that he’s heard "Be My Baby," by the Ronettes, more than 1,000 times. ^ Whitburn 2013, p. 37. ^ Howard 2004, pp. 61–62. ^ Eden, Dawn (1998-05-01). Short Takes; Garbage Version 2.0. Record Collector. pp. 136, 137. ^ Whitburn, Joel (2002). Top Adult Contemporary: 1961-2001. Record Research. p. 242. ^ "Top 200 Singles of '77 – Volume 28, No. 11, December 31 1977". RPM. Library and Archives Canada. Retrieved June 25, 2016. ^ "Top 100 Hits of 1977/Top 100 Songs of 1977". Musicoutfitters.com. Retrieved 2016-09-27. Howard, David N. (2004). Sonic Alchemy: Visionary Music Producers and Their Maverick Recordings. Hal Leonard Corporation. ISBN 978-0-634-05560-7. Whitburn, Joel (2013). Hot Country Songs 1944–2012. Record Research, Inc. p. 37. ISBN 978-0-89820-203-8. Greg Panfile's Musical Analysis of "Don't Worry Baby"
""Cassius" Love vs. "Sonny" Wilson"
"Keep an Eye on Summer"
"(Hey Won't You Play) Another Somebody Done Somebody Wrong Song"
"I Recall a Gypsy Woman"
"Whatever Happened to Old-Fashioned Love"
"As Long As We Got Each Other"
This page was last edited on 22 March 2019, at 03:19 (UTC).